The following narrative comes from an original card believed to be handed out to visitors touring the Palace Depression. ” The Palace Depression was brought about by a man who had faith in himself and his works. The greatest idea of originality ever conceived in the history of the world by one man with his two hands. The dream was of great value to the future generations ‘Education by thought’. The ‘Vision’ now externalized, the logical result of the application of a known principle, the same principle governs the universe and also mankind, proof of which now stands before the world. “Arriving in Vineland, NJ from the Western continent stone broke, he settled on an automobile graveyard, mosquito and reptile laden swamp, thickets and underbrush. The ground was of little or no value, one dollar per acre. “Self-educated, no schooling, no instructors, and without text books, he started to work without plans, tools or money, single-handed, no assistance, built a home backwards by slow motion and without a mortgage. “Turning to nature for help and nature did not refuse him, the plot of ground supplied all his needs, which was discarded materials such as automobiles, rocks, logs and an abundance of clay. He uncovered a stream of water full of fish and transformed the dismal swamp land into a lawn. 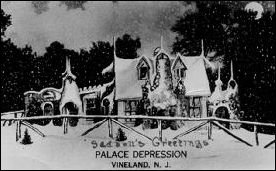 “Now applying his own original thoughts to the job on hand, as a result came the ‘Palace Depression’, a fantastic shrine of beauty, an unusual example of architecture which stands on a hillside beside a stream of water on Mille Road, south of Landis Avenue, at the old Stone Bridge, Vineland, New Jersey, and completed in three years time. Opened to the public Chsristmas Day, 1932. 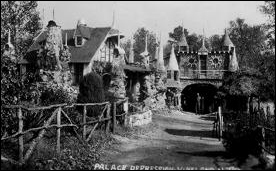 “The Palace Depression is the most unique house in the world, made possible by the construction of exterior doors in keyhole fasion, automobile mudguards forming the archways, and using neither locks nor keys on interior doors. “Door knobs, latches, benches, fireplace and all other parts of the house are made of petrified wood, stone or clay, all of which was taken from the immediate vicinity of the building or pulled out of the stream of water at the foot of the hill. September 1999 : The Palace Depression site is presently off-limits to visitors as historians and archeologists prepare to excavate the site in order to reconstruct the multi-colored home that was Daynor’s dream. Due to neglect, and vandalism only one feature of the home remains. We have also obtained “An Illustrated Lecture on the Palace Depression” but unfortunately, are missing “Series C.” If anyone can supply an original or copy, we would be most grateful. We’ll put up what we’ve got eventually as it provides a detailed description of the interior of the Palace Depression.